Everyone involved in the planning of the Sanday Development Trust’s Sanday Soulka was delighted by the support given to all of the events which were organised to ensure a packed weekend of sixteen activities that started on Friday afternoon - too many to allow detailed reviews, but the fact that extra chairs, and sometimes standing room, had to be found for all the inside proceedings will underline the capacity audiences. The pictures may give an idea of the great fun shared by everyone. 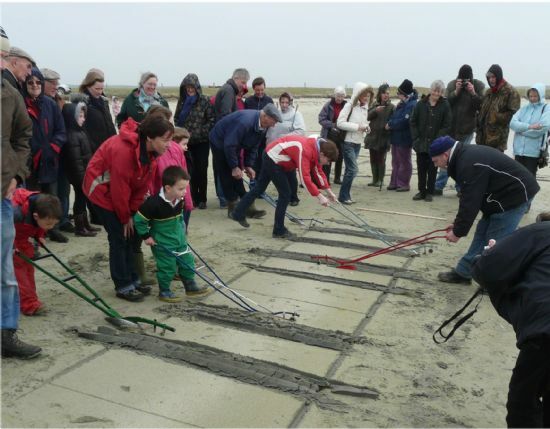 Many thanks and congratulations to all who entertained us: artists (Bill McArthur, Dominique Cameron, Ruth Brough) who opened their studios, Sanday School staff (Director Catherine Lennon) and children for the superb opening event ‘the Hogboon o’ Hellihow’ on Friday night. .....then paraded in costume for us to admire. 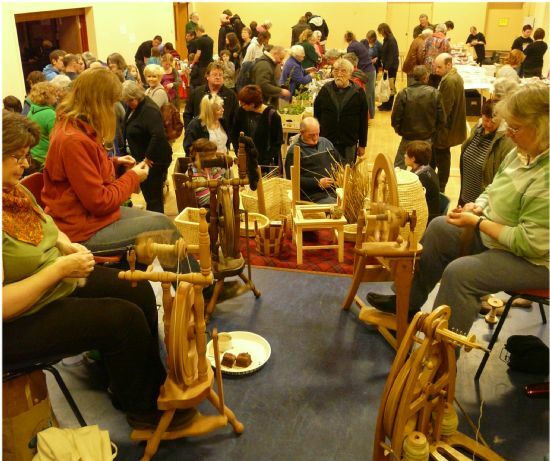 In the early afternoon there were displays at the School of Ploughing match regalia and Model Yachts – and in the Hall demonstrations of spinning and Orkney chairmaking by islanders (the Sanday Spinners and the Towrie family) while many local stallholders did brisk business at the Spring Fair organised by the Sanday Tourism and Business group. 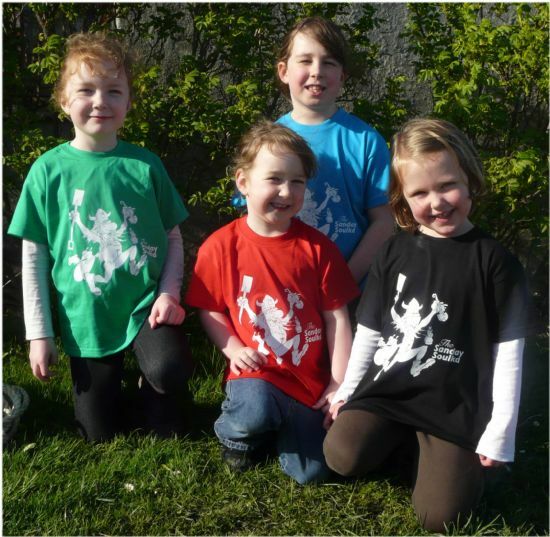 Sanday Soulka T-shirts were flying off the Soulka stall– see the website (www.sandaysoulka.org) to see how to order yours ! 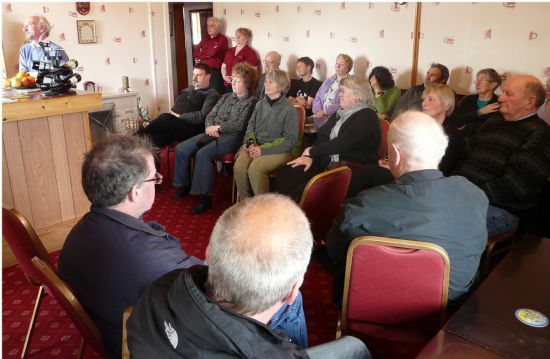 Immediately afterwards the room was packed for local Folk tales told by local folk – Lilian Harcus, May Allan and Graham (Nuckelavee- God save us a’) Clarke. 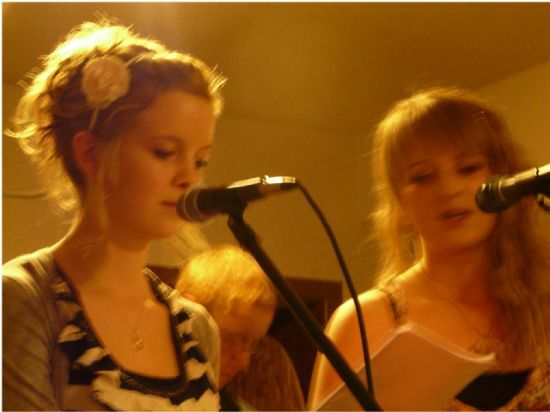 Between each story were delightful, sometimes poignant, songs from Sarah-Jane Gibbon and Emily Turton of the Big Orkney Song Project. Fred Tulloch defied doctor’s orders to ensure that model yacht sailors and spectators would not be disappointed – congratulations to Jeff Lonsdale, in his first race as skipper (of a model yacht) he took the honours ahead of Fred, and Dave and Douglas Drever. 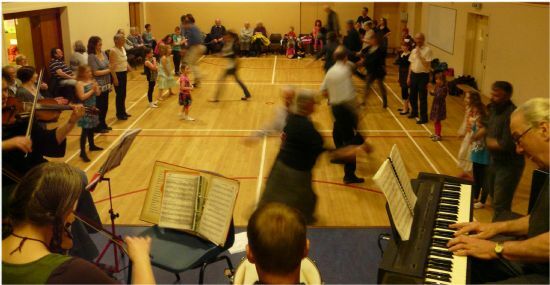 and finally it was down to the Kettletoft Hotel for the Young Westray Band – who had enough energy to play and sing until next morning…. 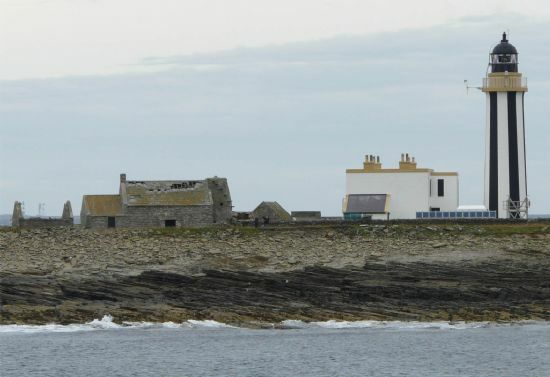 ..which began for early risers with a trip to and up the Lighthouse, with visibility good enough for clear views of Fair Isle. then Andrew Thompson introduced us to new excerpts from the island’s oral history archive, which has already produced a very successful CD ‘Sanday Voices’. 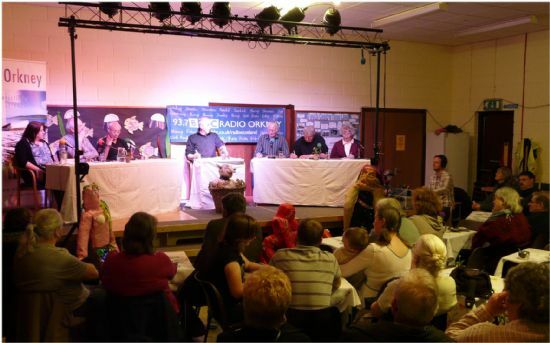 Another packed house followed at the Community School – BBC Radio Orkney was there to record a session of the Orcadian word game ‘Whassigo’. 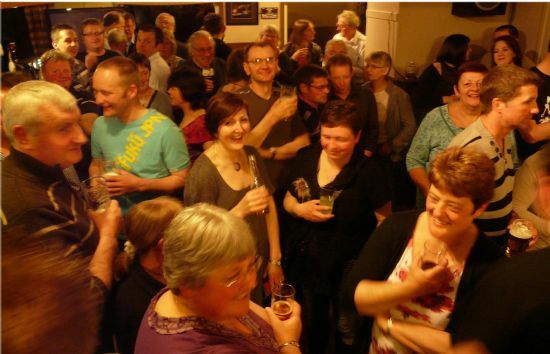 Harvey Johnston chaired the contest with his customary sense of humour and fun; the Mainland team consisted of Lynn Campbell, Norman Rushbrook, and Sandy Firth, and they were up against three of the island’s finest – Eileen Cooper, David Rendall and Andrew Skea. Many thanks to Sandy for his tribute to the ‘Gruellie Belkies’ on their radio debut, but the result is not to be revealed; you must tune in to find out – and to hear Andrew Skea reveal some of his youthful escapades. 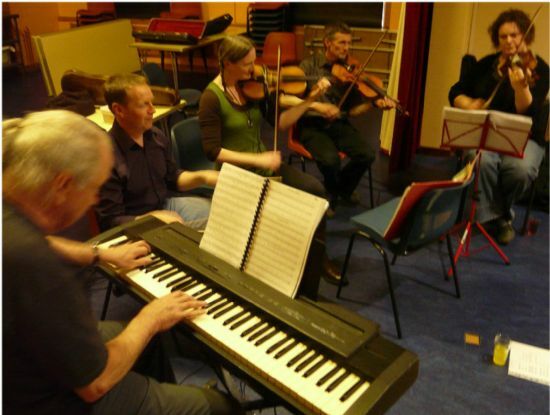 Finally, rounding off the weekend, the Sanday Fiddle Club (and Kate Howe sang as well) moved to the stage for their Easter Concert, youngsters and adults, experienced and beginners; everyone loved it, and all joined in the programmed songs. 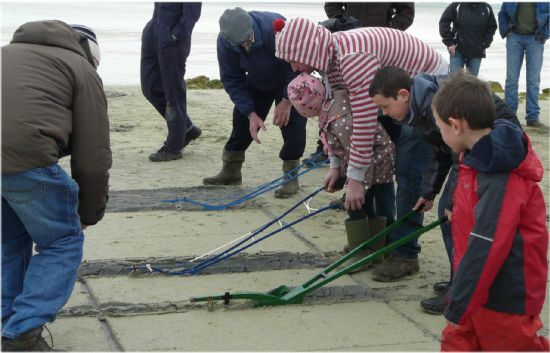 What’s next up in Orkney’s most buzzing isle this summer ? 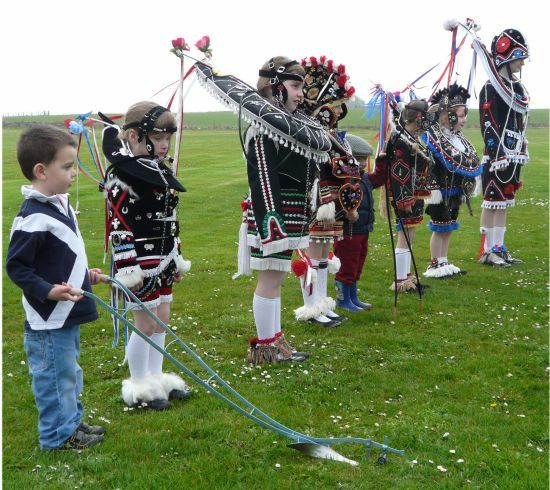 Well, for a start there’s the island’s May 20th-22nd extravaganza : Sanday Soulka – Stones and Bones – devoted principally to Archaeology . But visitors can also take the chance to listen to award-winning band Broken Strings and to watch some highly-accomplished extreme-sports enthusiasts …..and a great deal more besides. Check the website and follow us on Facebook !